A couple months ago I was visiting a dear friend who had some extra canvas sitting around her house. I took a square shaped one that was already pre-stretched and it had a gyclee on it home with me with the intention that I would be using this for a Mickey Mouse DIY painting project to be hung in Ben’s big boy bedroom. Being that the canvas already had a giclée on it I went ahead and used a paint primer that I picked up at Lowe’s. If you’re trying to do this project you can also use a few layers of gesso and a sponge brush. I did about four coats of the primer using a house painting brush and allowing each coat to dry in between. I was very careful that the coats were thin and even. I also painted the sides. Once that was done I made my circle templates out of craft paper just tracing around a large sized salad bowl and a cereal bowl twice. I cut them out and taped them down flat onto the dry canvas. 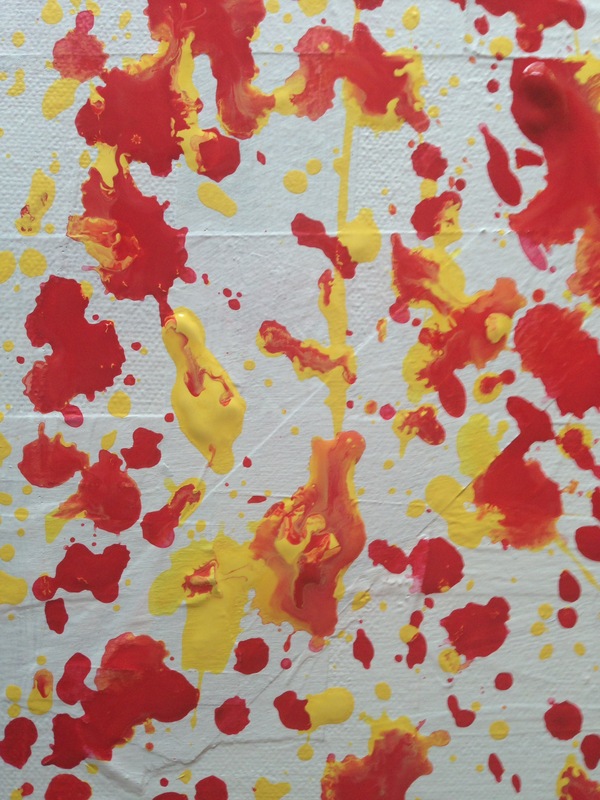 After that I began splattering paint in yellow, red, and black across the canvas. Tip: You want to make sure when you’re doing this to start with the lightest color to the darkest allowing each color to dry completely before adding another color otherwise the colors will run into each other and you’ll get a murky look. I made sure to let some paint drip down the sides as well. I let the painting dry overnight. I was able to hang it up with Command Strips that I placed in each corner. Then I bought these cute wall decals from Babies R’ Us that I stuck on the wall underneath the painting. Moving onto the numbers that I painted Mickey Mouse style. I bought the numbers and the wood circles from Michael’s. The Mickey Mouse wall plaque I got from Amazon. The numbers were really easy to make but do require a little bit of painting skill. You could also apply the same method with the wooden circles for ears and the colors to letters if you want to make a name plaque or the ABC’s. The numbers came already primed with white paint. I simply taped off the bottom of each number so I would get a clear edge when I painted the yellow coat of paint. While I waited for the paint to dry I used Gorilla Glue to glue the wooden discs onto each number for mouse ears. Once the yellow paint was dry I carefully removed the tape. I recommend using painter’s tape. If you don’t have painter’s tape you can use masking tape but you do run the risk of a peeling off part of your acrylic paint and not having a clean edge. I taped off the middle of each number to paint the red paint, but before I painted the red I added yellow circles for buttons. I painted on the red paint, allowed it to dry. I then proceeded to tape off the top of the numbers to paint black. After I allowed the red paint to dry I repainted the yellow buttons. Sometimes when you’re painting you have to add another layer in order to have a nice clean edge. Another option if you don’t feel comfortable painting buttons on each number, you can purchase small yellow or white buttons and glue them on. If you do choose to paint on the buttons I recommend using a very small paintbrush. For the rest of the project are used in medium size paintbrush. The project in all took me two evenings to complete. I used Command Strips to hang up the numbers and the Mickey Mouse plaque. Ben really loves this display in his room. He practices counting his numbers in both English and Hebrew when he sees it. I think having DIY accents in the room separates Ben’s Mickey Mouse themed bedroom from others. I didn’t only rely on the same merchandise we see in every superstore, department store, and baby store. I added unique pieces to give it a personal touch. Art is a fun, inexpensive, and easy way to add a little DIY flair to your child’s room. When we decided to switch Ben’s nursery into a big playroom I knew immediately what the theme would be: Mickey Mouse. He’s obsessed with Mickey Mouse Clubhouse-it is his favorite show, we watch it every day. He has every Mickey Mouse toy you can imagine, and we went to Disneyland for his second birthday. The problem was that we had nothing as far as Mickey Mouse furniture or even artwork. Along the way a friend of ours was selling their son’s red Corvette bed, which my husband picked up for Ben as a Hanukkah present. It goes along with a Disney Cars painting we received for Ben’s first birthday. I thought we could kind of combine Mickey Mouse and the car theme because the new show Mickey Mouse and the Roadster Racers is coming out and so it really works out perfectly. This rocking chair was given to us by a friend who’s granddaughter outgrew it. It was a typical brown wooden rocking chair. I saw a DIY Mickey Mouse painted chair on Pinterest this past fall and have been dying to replicate it. The first thing I did was paint the whole chair white with a primer I picked up at Lowe’s. I did two coats of white. I allowed them to dry completely in between coats. My biggest piece of advice that I teach all my students when it comes to painting anything is to start with your lightest color and leave your darkest color for last. For this project I simply used acrylic paint that I purchased at Michael’s. I started with the yellow on the bottom of the rocking chair and the two circles on the seats for Mickey’s buttons. The next step I did was the red seat which I had to be very careful painting-especially around the circles so that they still looked pretty smooth around the edges. Tip: When you’re painting a piece of furniture it’s really important that you look at it from every angle, make sure that you get behind it in front of it you look on top of it facing downwards and you get underneath it and look up in between every single coat of paint. You’ll be surprised at how much you’ve missed! Lastly I painted the black sections and added the black creases for the gloves on the handles of the rocking chair. When you’re painting a piece of furniture with several colors like this you want that the color will be opaque. Stay away from semi-transparent, glossy, or pthalo type colors. Once the rocking chair was finished I took it up to Ben’s room and I must say it has been a really great addition to his big boy Mickey Mouse bedroom. It’s a piece that definitely brings that theme of Mickey Mouse into the bedroom and completes the look. I’m glad I was able to do this on a budget-using a chair that I got for free and was already in my home, with small tubes of acrylic paint that I purchased only for a few dollars at Michael’s. Just like the rest of our house our kids’ bedrooms are going to change over the years and it’s good to be able to do so while conserving money through DIY projects like this. As I’ve mentioned before I read A LOT to my boys. We are working towards 1000 books by kindergarten. I keep a log and every time they read another hundred books they get to put their names up on the board at our local library. Of course I love to read to my boys about art. I am sharing with you some of my favorite books that we are currently reading about art. Many of them are not just for babies or toddlers but could also be appropriate for elementary school age children as well. 1. Artsy Babies Wear Paint by Michelle Sinclair Coleman-this is a great all-around art book for a baby to toddler age child. It discusses the concept of creativity, has cute illustrations, and is very colorful. Children at a very young age can start to learn about media as they begin to experiment with it . 2. I Know An Old Lady Who Swallowed a Dreidel by Caryn Yacowitz -a tongue twisting story with incredible illustrations that reference famous works of art by Andy Warhol, Van Gogh, and Andrew Wyeth. This is my favorite book to read at Hanukkah! 3. Too Much Glue by Jason Lefebvre -a fun romp through the art room turns into a disastrous mess! I have a collage project that I do to accompany this story. I adore this book-great for kids who go to school already.